It’s incredible what a big transformation can be made with just a little love. Zelda was abandoned at Pet And Wildlife Rescue (P.A.W.) in Chatham-Kent, Ontario overnight. She was tethered to a pole, riddled with fleas and in overall bad shape. According to BlackburnNews.com, she was so severely underweight that her entire ribcage was visible through her skin. 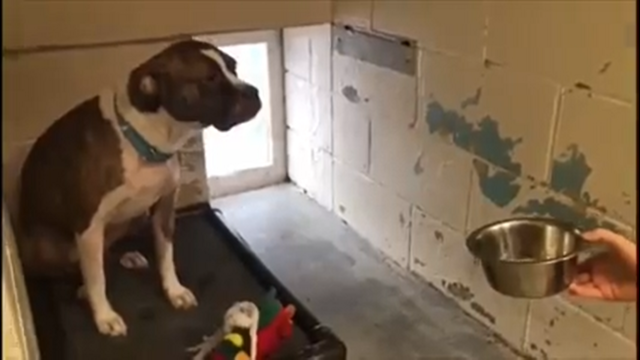 When a shelter employee tried to untie her, she became aggressive and wouldn’t let anyone close enough to free her. P.A.W. was patient and gave Zelda the time she needed to come around and understand that they were there to help her. But it wasn’t time she needed so much as a friend. The rescue tried introducing her to a playful dog, hoping that it would bring her out of her shell. When Chantelle saw that Zelda enjoyed being with other dogs, she decided to foster her and introduce her to the two-dog pack in her home. Zelda was much more comfortable with her new dog friends than she was with the humans in the house. At first, Zelda would only approach Chantelle and her boyfriend if the other dogs were with her. But after awhile she let go of her fear and allowed herself to become a real part of the family. So much so, that she became their foster fail!